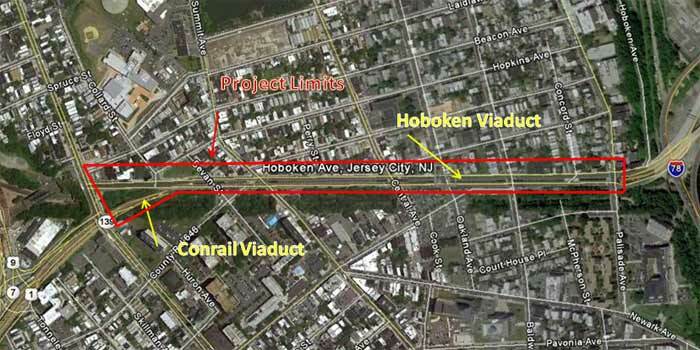 Work under Contract 2 involves deck replacements and other work on the Conrail and Hoboken Viaducts. Work under this contract is anticipated to be completed in 2017. Making the Pulaski Skyway stronger and better. The Hoboken and Conrail Viaducts are sections of Route 139. Route 139 features Upper and Lower roadways, extending from the eastern end of the Pulaski Skyway to the Holland Tunnel. It provides eastbound motorists with access to Hudson County and New York City destinations, and provides westbound motorists with access to the Pulaski Skyway, Newark and points west. The Hoboken Avenue Viaduct (Upper Roadway) is a four lane east-west divided arterial in Jersey City which carries traffic from the Pulaski Skyway to the Holland Tunnel. The Lower Roadway, located beneath the Hoboken Avenue Viaduct, also serves as a link between the Jersey City and New York. The Conrail Viaduct is a four lane, 12 span structure. It is located between the Hoboken Avenue Viaduct and the Pulaski Skyway and crosses over abandoned Conrail railroad tracks. Replace the deck, supporting beams and columns supporting the eastbound side of the Hoboken Viaduct and resurface the westbound roadway. Replace the deck on the Conrail Viaduct and strengthen the supporting trusses. Operational improvements at several intersections on the Upper Roadway.